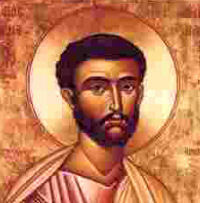 God our Father, you filled St. Barnabas with faith and the Holy Spirit and sent him to convert the nations. Help us to proclaim the Gospel by word and deed. We ask this through our Lord Jesus Christ, your Son, who lives and reigns with you and the Holy Spirit, one God, for ever and ever. Amen. St. Barnabas, designated by the Holy Spirit to share the charge and mission of the twelve Apostles, is venerated by the Church as one of them. He played an important part in the first extension of Christianity outside the Jewish world. It was Barnabas who presented St. Paul to the other Apostles when, after his long retreat in Arabia, he came to Jerusalem for the first time after his conversion to submit to Peter's approval the mission to the Gentiles entrusted to him by the Master Himself. Barnabas was Paul's companion and helper on his first missionary journey and returned with him to Jerusalem, but left him when he set out on his second journey and went to Cyprus. The name of St. Barnabas is mentioned in the Canon of the Mass. Strictly speaking, Barnabas was not an apostle, but the title has been bestowed upon him since very early times. His first name was Joseph; Barnabas (etymology: "son of consolation") was a surname. He belonged to the tribe of Levi. He was a Hellenist, that is, a Jew who lived outside of Palestine and spoke the Greek tongue. Born in Cyprus, he embraced the faith soon after the death of Christ, becoming a member of the original Jerusalem community. His first noteworthy deed was to sell his belongings and place the money at the feet of the apostles. It is to his lasting credit that he befriended the neo-convert Paul and introduced him to the apostles when everyone was still distrusting the former persecutor. More noteworthy still was his service to the universal Church by being the first to recognize Paul's potential for the cause of Christ; it was Barnabas who brought him from Tarsus to teach at Antioch. The first missionary journey (about 45-48 A.D.) the two made together, and Barnabas seems to have been the leader, at least at the beginning (Acts 13-14). Barnabas' appearance must have been dignified and impressive, otherwise the inhabitants of Lystra would not have regarded him as Jupiter. He was present with Paul at the Council of Jerusalem (ca. 50). While they were preparing for the second missionary journey, there arose a difference of opinion regarding Mark; as a result each continued his labors separately. Barnabas went to Cyprus with Mark and thereafter is not referred to again in the Acts of the Apostles or in any other authentic source. From a remark in one of Paul's letters we know that he lived from the work of his own hands (1 Cor. 9:5-6). The time and place of his death have not been recorded. It is claimed that his body was found at Salamina in 488 A.D. His name is mentioned in the Canon of the Mass since ancient times. Patron: Antioch; Cyprus; against hailstorms; invoked as peacemaker. Often portrayed as: middle-aged bearded apostle, often bearing a book or olive branch; standing on or near a pile of stones while holding a book; stones; with Saint Paul. Read the passages from the Acts of the Apostles about St. Barnabas: Acts 4:36-37; 9:26-29; 11:27-30; 12:24-25; 13:1-12; 13:27-30; 13:44-52; 14:1-14; 14:21-23; 14:36-40. Read the Catholic Encyclopedia's account of the life of St. Barnabas.